#1,522 Good Visit. – Laurel Mercantile Co.
Now reading: #1,522 Good Visit. So I’ve done it. 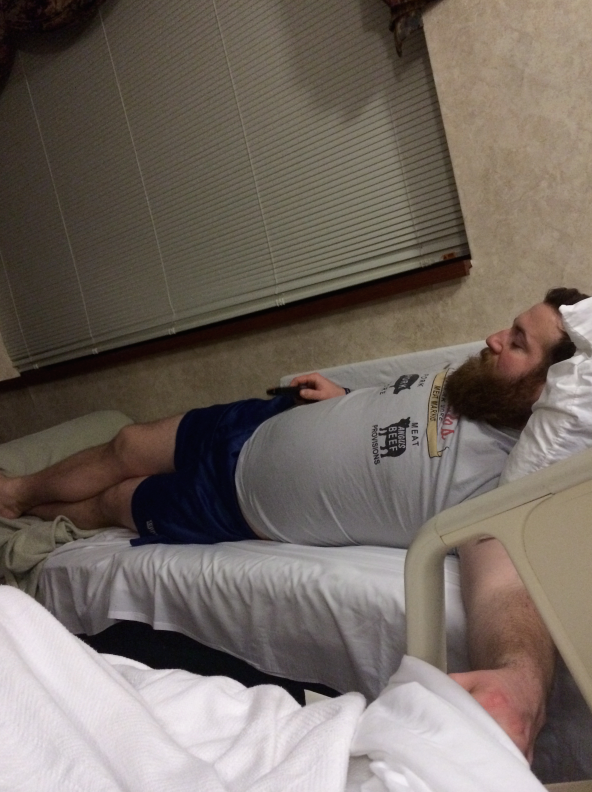 I’ve stayed the night in the hospital. And honestly… I sort of loved it. South Central Regional Medical Center has been daddy’s hospital for a million years, and it’s the only one we ever went to when anyone was sick in our family. I know so many faces when I walk through those sliding doors, it feels like home—even if it is a hospital. I was in the fancy women’s wing with lamps and hardwood floors and what not. I ordered whatever I liked from a huge trifold menu (pancakes). My bed felt like the most comfortable bed I’ve ever been in. Temperature was just right. Pitch black except for the light from my IV pole. The nurses were so quiet and sneaky when they would come in to check my vitals (and bring me whatever my heart desired—Coke, crushed ice, water) that I barely opened an eye. And poor Ben had to sleep on the naugahyde sofa beside me. This morning around 8:30 am after what felt like the best sleep of my life (thanks, Demerol!) I ordered another meal off the menu (pancakes) and then took a long, hot shower before packing up and heading home. 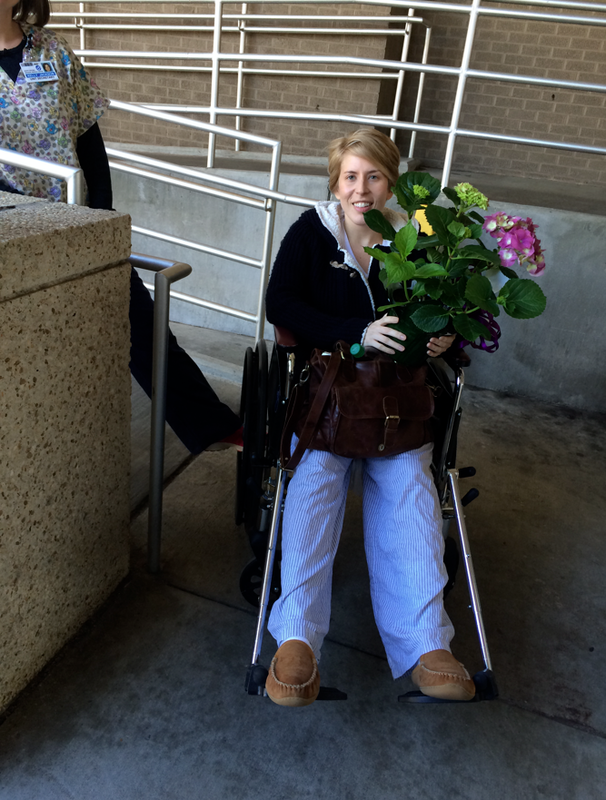 With such awesome pain meds, I easily could forget why I was there. It felt like a hotel. 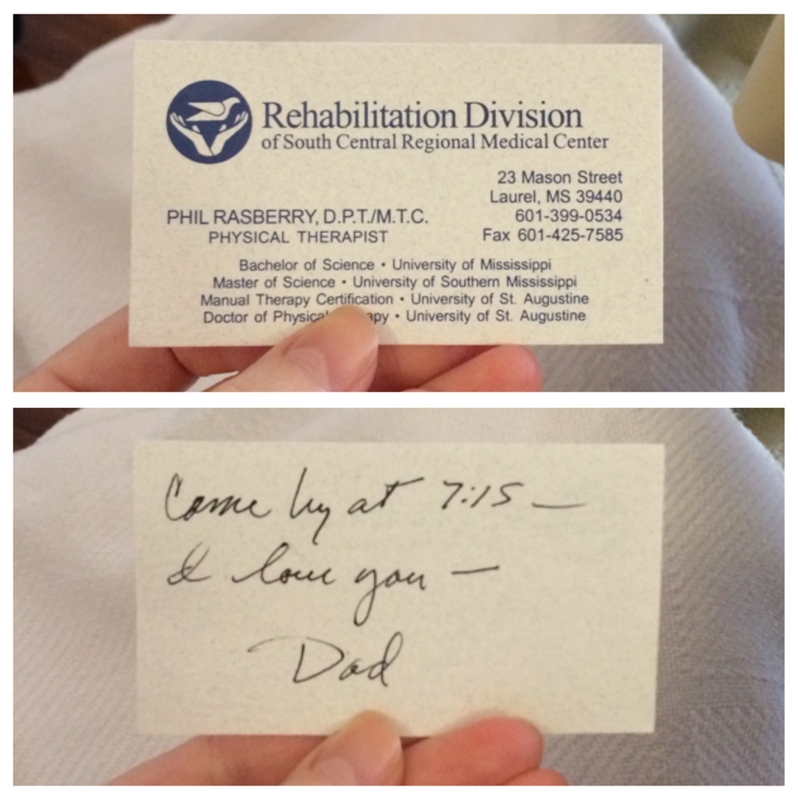 When it was still dark in my room, I woke up to find daddy leaving his business card on my bedside table. I was so happy to see him when I understood it was him. This is as sweet as it gets for this man. And now I’m home again where all kinds of sweet happies have been popping up, like these hydrangeas from my cousin Emily. 7 prayergrams from the Baptist church were in my mailbox, then Emily came by with fresh homemade almond cronuts (SO GOOD), then mama came by with a Lollia bath set, a locket necklace and ticking stripe Mississippi tea towel from Southern Antiques, and Andrea sent my favorite soap from the shop as a feel better gift, too. Then Aunt Phyllis was there soon with her famous banana pudding. And Clark came a few minutes later to check on me. Then a flower delivery man was on the porch with a gorgeous bouquet from Mrs. Judi at Laurel Main Street, and then our neighbor Mrs. Dawn was knocking with chicken and sausage chowder, homemade rolls made from wheat she ground herself (?! ), salad with a homemade Italian dressing, and oatmeal chocolate chip cookies. She sat on the couch and held my hands and told me about how she had been right where I was one time, that everything will work out exactly how God planned it. You realize how special life in a small town is when something kind of scary happens (even if it is a pretty common thing). People swarm around you with prayers and hugs and good food, and it fills up the dark corners with the light of God’s love. I want to be more mindful to be the light for other people from now on because of it. Still waiting to hear where I’m going for the next surgery, but we’ve got high hopes for one certain doctor. Cross your fingers and toes, friends. We need him!